Project obstacles and solutions: The Andersons Grain Group is expanding its Oakville Elevator capacity. 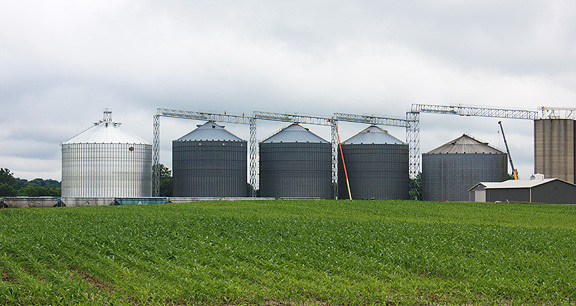 This has included the construction of a new 750,000 bushel grain bin, a receiving pit, handling system scales and the expansion of an overflow grain pad for temporary storage. The project was started in the winter of 2014 and is scheduled to be completed by the start of harvest during the fall of 2015. Key to grain storage is concrete that has minimal cracks. Cracking can occur due to weight or in thermal extremes. Controlling the cracks in concrete is imperative so that moisture and bacteria prevention are enhanced. A big key to controlling cracks in concrete is the aggregates used as a base and fill material. IMI supplied No. 53 stone that was compacted before the concrete was poured. They supplied No. 8 stone that was used as a backfill material. This provided a solid base that supported the weight of the grain. Thermal cracking can be controlled with reinforcement in the concrete. In a storage bin situation, where drying of grain is critical, temperatures inside the bin can vary greatly from external temperatures. Grain drying temps can reach over 100 degrees F. Since the concrete is exposed to the outside ambient temperatures along the walls, thermal cracking can occur during extreme differences. A crack in the concrete can lead to bacteria and mold forming on fines and broken grain sifted into the cracks. Moisture can also form in the cracks, causing problems in drying the grain. To keep the concrete from cracking, IMI added micro synthetic monofilament fibers to the concrete mix for the bin floor and the grain pad. Fibers are an easy way to control cracking in lieu of reinforced wire methods. Since the fibers are mixed throughout the entire batch of concrete, they provide a better three dimensional crack control. IMI supplied 15,000 tons of crushed stone for the base of this project. They also supplied 4,500 yards of concrete for the receiving pit, scales and the grain bin – footings, floor and walls. They supplied another 350 yards for the extension of the grain pad. For more information on using fibers in concrete, click here.